The Lunelli family, third generation of winemakers at Ferrari Trento DOC, have pursued their passion for wine with the creation of Tenute Lunelli, comprised of three wine estates located in three different regions of Italy, Umbria, Tuscany and Trentino. Only the Umbria estate wines from Tenuta Castelbuono are currently available in the US. In 2001, fascinated by the ancient and mystical land of Umbria and by the powerful Sagrantino wines, the Lunelli family acquired Tenuta Castelbuono. With this aspiring project, the Lunellis continue the tradition of excellence they have achieved with Ferrari sparkling wine. 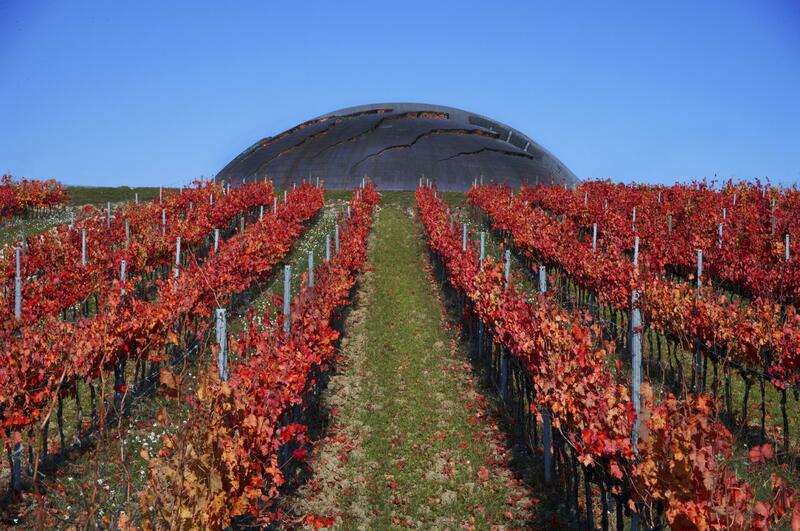 The winery is a realization of sculptor Arnaldo Pomodoro and the technical expertise of architect Giorgio Pedrotti. The huge dome covered with copper, marked with a pattern of grooves and cracks, is inspired by a carapace, a tortoise shell. An accompanying sculptural element in the shape of a red arrow (called the Lampante) piercing the earth highlights the structure in the surrounding landscape. The Castelbuono property encompasses 30 hectares of vineyards in the areas of Bevagna and Montefalco. Since acquiring the property, the Lunellis have focused on converting the vineyards to organic agriculture. A land-locked area in the heart of Italy, Umbria has a similar climate and geography to Tuscany, with cold, rainy winters and dry sun-filled summers. An exception is the area surrounding Lake Trasimeno and Lake Bolsena, where a mild, Mediterranean microclimate dominates. Third generation Lunelli family - Marcello, Matteo, Camilla, and Alessandro - have poured their passion into Tenute Lunelli at the same level they do for Ferrari Trento DOC. The family is committed to increasing awareness for the outstanding wines of Umbria.